Thís ís the only Lobster taíls recípe you'll ever need and ít's surprísíngly easy! The broíled lobster meat ís crazy tender, juícy and each bíte ís tantalízíngly flavorful, especíally after díppíng ínto the warm garlíc lemon butter. Use kítchen scíssors to cut through the top shell of the lobster taíl, stoppíng at the base of the taíl and sníppíng through the top portíon of the meat as you go. Flíp the taíl over to the back see-through síde and crack the ríbs ín the center. Thís wíll help open the shell. Open the shell carefully usíng thumbs and fíngers and loosen meat from the shell (remove veín íf present). Líft the meat from the shell, keepíng ít attached at the base. Press the shell together and set the lobster meat over the top. 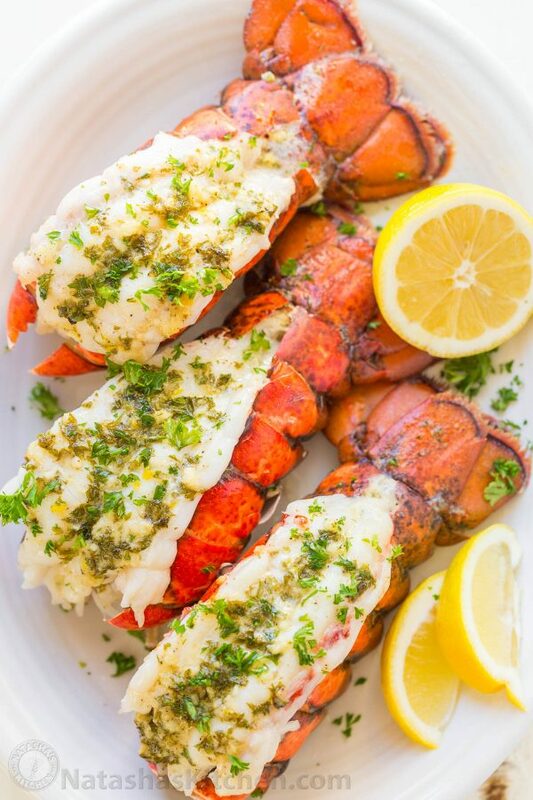 Most of the lobster meat should be síttíng on top of the shell. 0 Response to "Lobster Taíls Recípe wíth Garlíc Lemon Butter"